Toddlers are transitioning from infancy to the mobile, independent world of preschoolers. They are learning in leaps and bounds how to communicate, move purposefully and assert their individuality. 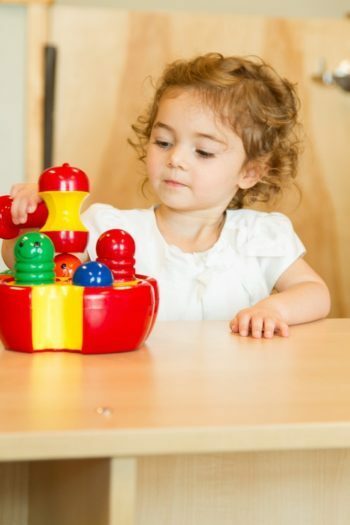 At Stepping Stone School, our teachers introduce balanced routines and offer positive guidance to help give your toddler the confidence to practice new skills and embrace new experiences. Weekly, theme-based learning plans meet the diverse needs of every child through research-based activities. In particular, language development accelerates during this period (Hart & Risley). Our teachers focus and enhance verbalization and skill development. This consistent and vibrant learning atmosphere matches your child’s rapidly emerging interests and abilities. It offers numerous opportunities for early reading, math, science, construction and imaginative play experiences, integrated into our Platinum Learning for Life™ curriculum. Using books, rhyming songs and fingerplays to promote the use of speech in social settings. Increasing vocabulary through reading books and identifying objects. Developing pre-writing skills through regular art activities. Enhancing Language Development/ Responsiveness/ Listening Skills by participating in guessing and listening games. Expanding use of American Sign Language [ASL] and incorporating multiple languages as vocabulary expands. Developing fine motor skills through coloring, painting, gluing, working puzzles and building with blocks. Strengthening gross motor skills by practicing climbing, hopping and tumbling in our secure and closely monitored indoor and outdoor natural play areas. Developing social and emotional growth through positive interactions. Nurturing a deep respect for oneself and the needs and feelings of others. Engaging in independent activities and fostering peer relationships. Investigating cause and effect relationships. Discovering patterns, shapes, sorting, and matching activities. Exploring items in nature, classifying materials, observing reactions.